Even at the height of the tourist season on Capri, there are a few places you can go that are so out of the way that you really can wander for hours and scarcely pass another person. Obviously, the town of Capri, itself, is not one of those places. Perhaps if you head up to the eastern height of the Villa Jovis, you might leave the flabby hordes behind, but, alas, up there you will run into at least small groups of very healthy tourists barely warmed up from the one-hour climb; they will trample you in the same fashion as their out-of-shape friends are trampling the beautiful flowers of the Gardens of Augustus back in town. No, you must smite the sounding furrows and sail (or at least take a bus) towards the baths of all the western stars, yea, even beyond the villa of Axel Munthe at Anacapri (though well worth the visit) and even past the fine chair-lift to Monte Solaro (also worthwhile). Go through and past the main part of the town of Anacapri, itself, as if you were walking up the stem of a gigantic capital letter "Y"; at the fork, the road on the left leads to the lighthouse at Punta Carena, and the right leads down to the Blue Grotto. The blank triangle in the middle is the western side of the island of Capri; that is where you want to go, but you can't go straight at the fork; you have to go either to the extreme left or right and then find the "trail of the forts" that leads across from one side to the other, along the entire western slope of the island. If you find it, remember how to get back, because you may very well be alone. Whereas Capri was protected with continuous walls, the wide-open western stretch of the island below the town of Anacapri was fortified by the English with a string of blockhouses. To a certain extent, some of these installations are on or near sites of earlier, strategically placed “Saracen towers,” which for centuries had provided protection against pirate raids. 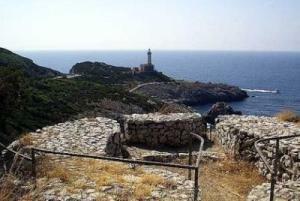 The trail of forts stretches from the Blue Grotto on the leeward northern side to the lighthouse at Punta Carena on the southern side. The most interesting blockhouses are those at Orrico, Campetiello (also called di Mesola) and Pino. Although they were originally built by the English in 1806, they were then enlarged by the French after they took Capri at Orrico (top photo) on October 4th 1808. There is an additional small blockhouse called il cannone (the cannon) facing Tombosiello creek (photo, left). 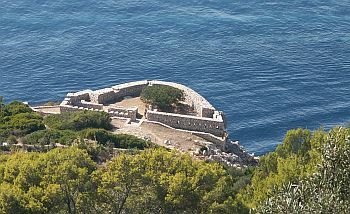 These small forts plus a few towers along the stretch constituted the western defensive system for Anacapri. As with almost every other historical site in the Bay of Naples, these forts have legend connected to them. The fort at Orrico, for example, is said to be where the island's first Greek inhabitants, the "Teleboi", disembarked from Epirus. There is, in fact, a convenient landing stage near the fort; it is from here that the Aragonese (who took the island from the Angevins in the 1400s) and then the English and French attacked and conquered the island. Restoration of the “Trail of forts” was begun in 1998, partially funded by the European Union. (2) the Villa of Gradola, immediately above the Grotta Azzurra. The buildings are strung out across the villa’s terraces in a panoramic position along the slope and had a stairway leading down to the grotto. The villa was excavated in the 19th century by the eccentric American Confederate Colonel John Clay MacKowen. He found capitals, fragments of statues, columns, and flooring, some of which he moved to his Casa Rossa in Anacapri, a current tourist attraction. -Beloch, Julius. Campanien. Geschichte und Topographie des antiken Neapel under seiner Umgebung. Pub. Morgenstern. Breslau. 1890. -Houston, George W. “Tiberius on Capri” in Greece & Rome, Second Series, Vol. 32, No. 2 (Oct., 1985), pp. 179-196. Cambridge University Press on behalf of The Classical Association. -Maiuri, Amedeo. Capri. Storia e monumenti. Istituto Poligrafico dello Stato, Rome. 1957.